The weekly balance has tipped, we are now on the downhill towards the weekend! Only 2 more days of school until a nice long weekend! Woohoo! Today's been a battle, we were very busy, short staffed and to top it off my head has been feeling very fuzzy, like the beginning of a migraine! I didn't sleep well last night either so I'm going to get a really early good sleep tonight! Today I have the other 21st birthday card I made for Bekah's birthday last week! You can see the first one I made here, as that one was really soft and elegant so I wanted something quite different, I think this hits the brief! I pulled out one of my most favourite pattern papers of the moment - Naturals Composition. I just love the neutral colour that seems to work beautifully with any other colour. Its also got gorgeous glossy embossed designs which are just crying out to be inked up. Here I used 2 colours - bermuda bay and rich razzleberry to create this ombre type effect. By applying both colours to the centre section it really helps the 2 colours to blend together! 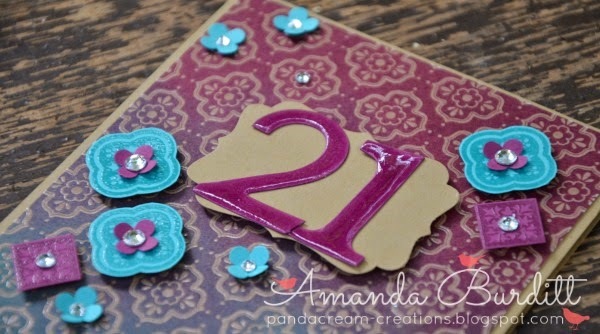 I started with the 21 on the decorative label punch on the card and then worked in the other elements around it. I love the mosaic pattern in the paper and immediately thought that the Mosaic Madness set would pair perfectly as some scattered elements. I also decided to add a few of the 4 petal itty bitty punches to fill in the gaps, and the shape worked well with the mosaic stamps and paper too! I wanted this card to be quite fun and jazzy so I went a little crazy with lots of little rhinestones in the centre of the mosaics and also a few just scattered on the background mosaics. 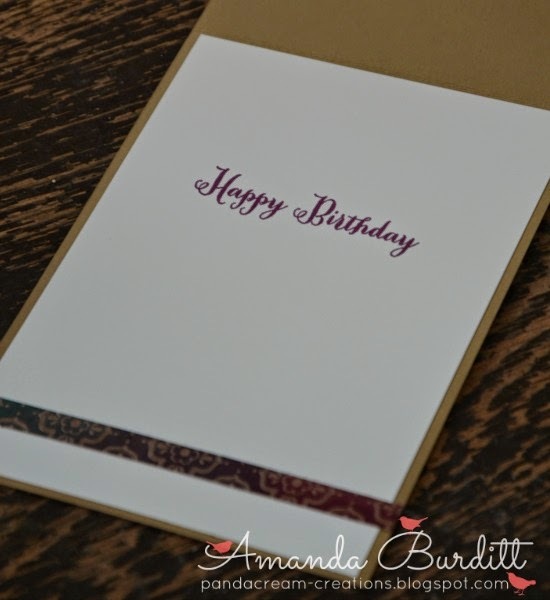 Love that look, plus it just gives the card that extra special touch! 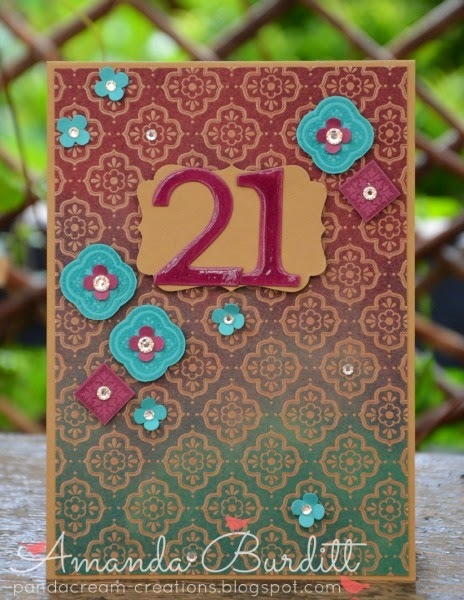 One final special touch I added to the front of the card was to add crystal effects to the 21 - it just makes the letters look more special and blends with the glossy embossed background paper too! I think its little touches like this that really help make a card! The patterned paper ended up being a little larger than I thought I was going to want so I trimmed off about 5mm, I was going to throw it as it really wasn't much good for anything then thought it'd be a nice little embellishment for the inside. I added a sentiment and that was the inside sorted! Bekah totally loved this card and so did I! If I was turning 21 again I would be totally over the moon to get this card! Its so my style! Oh my, this is fantastic! Love the color choices and hownit so changed up this great dp. Thank you for the inspiration on how to use up more of my stash!